JUST WHO IS THIS FASCIST LIEBERMAN? 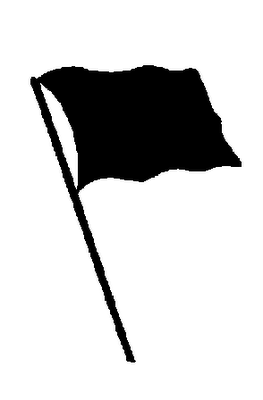 A black flag was just raised in Israel. Herr Lieberman was approved as a full member of the Israeli government and a minister to boot (pun intended). What exactly is known about this evil creature? As time goes on more will be known…. but to date there is enough to know that this is bad news to both Palestine and Israel. Following is an essay written by Palestinian journalist Khalid Amayreh. I posted an essay by him the other day comparing zionism to nazism. This piece gives a pretty clear picture of just who Lieberman is and why he is a threat to democracy. Thanks to Umkalil for posting this on her blog. The essay originally appeared in Comment. Have you ever wondered why almost everybody in Israel and north America is silent about the imminent inclusion of the Nazi-like figure of Avigdor Lieberman into the Israeli government of Ehud Olmert? Now this Lieberman is apparently slated to become Israel’s deputy-prime minister and, more significantly, Minister for handling Strategic Threats facing Israel. Well, would that include giving him at least a partial authority over Israel’s estimated 300-400 nuclear bombs and missiles? Everything is possible in this strange state that is yet to wake up from a nearly congenital collective psychosis that makes her murder children on their way to school and drop 1.5 million cluster bombs in Lebanon, all under the rubric of ensuring security. Indeed, Lieberman, whose party controls 11 seats of the 120-seats making up the Israeli Knesset, draws support from wide sectors of the Israeli Jewish public beyond his immediate constituency which more or less support his fascist ideas about disenfranchising and even expelling non-Jewish citizens of Israel who make up nearly one forth of the population. To read a brilliant ‘opinion piece’ by Tamar Gozansky, former Communist member of the Knesset, click HERE. I hope those bastards who voted him into the Olmert government are satisfied with themselves. From the first link you provided, I read a quote by Olmert saying,”He [Lieberman] will be in charge of collecting the strategic intelligence in Israel”. JESUS CHRIST! I have read many Jewish blogs but this is the only one that views the Israeli conflict from the others perspective. I just want to say thank you, inshallah if all people are like you how wonderful the world will be. If we can see the other perspective just as much as we see ours how quickly we could solves most of our problems! I just want to know. How do Jewish/Israelis view the creation of Isreal? I don’t know your side of the story. Can you give me a link where I’ll be able to read about your perspective. Thank you. inshallah I’ll be coming back. Unite Muslims… thank you so much for visiting and commenting. Your comment means very much to me and is most appreciated. All the best to you my brother… and please do come back. It is a pre-programmed disaster … bound to happen! Lieberman is one of the most radical and racist miserable individuals I ever came across! He is the epitome of an ARCH-zionist in the worst possible fashion, lacking ANY kind of compassion and feeling for justice! GOD help humanity – and the Palestinian people … the vortex down the drain just added two gears!! You are so right Karin…. neither side in this area deserves that nazi in the government… not the Israelis or the Palestinians. His entry into the government only means more deaths… on both sides. Why is US not saying anything? What about UN? What is this? Are we living in a world of open liers!!??? But everything has something good in it. Hopefully, this will somehow lead to return of Palestinians, who have been living in miserable conditions in tents, without a kitchen, without furniture, without anything normal. It’s up to the people to have their say… the governments are obviosly not saying or doing enough. This is obviously bad for Palestinians, but maybe it will prove worse for Israelis. If ever they wanted a good recruiting tool for Palestinian extremists, they have it now. Also bad for Israel is that he doesn’t represent them, at least I hope not. Bringing that racist into the Israeli governemnt is sure to cause literal and figurative explosions. The US and EU are absolutely crazy to deal with Israel with this man in government. Those entities have passed judgement on other countries and refused to deal with various other hatemongers, yet on this the EU says we disagree, but are still dealing with them and of course the US says nothing because the Israel lobby group bought them. tcdrtw…. thanks for visiting and for your comment. Everything you said is ‘right on’…. it’s a very sad situation, to say the least. Forgot to mention … I know Tamar personally – she is GREAT, sharp and logic in judgement – and a fantastic human being!! Tamar is a wonderful human being Karin. When she was a member of the Knesset she was regarded by many… both on the right and left… as the only HONEST member. She had the respect and admiration of all. It was a sad day for Israel when she chose, for personal reasons, not to run again. Hopefully she will change her mind by the time we have another election.